Teresa Barns, age 66, long-time resident of Tonkawa passed away Monday, March 27, 2017 in Ponca City. A memorial ceremony to celebrate Teresa's life will be held at 2:00pm, Monday, April 3, 2017 at the Tonkawa First Assembly of God Church with Pastor Kelly Coffey officiating. Following the ceremony, she will be laid to rest with her parents at the IOOF cemetery in Tonkawa. Honorary casket bearers will be Daniel White, Donnie Rosebery, Ty Funk, Scott Funk, Mark Schultz, Lester Schultz, Brad Coffey, Bob Coffey, and Chuck Neely. Arrangements are under the direction of Trout Funeral Home & Cremation Service of Tonkawa. Teresa was born on March 14, 1951 to Jack Leigh Barns and Elva Mae Cochran Barns in Ponca City, OK. Teresa was raised in the Tonkawa area, graduating from high school there in 1969 before attending NOC where she graduated with an associate's degree in business. Faith and her church defined Teresa's life. The word of God was the guiding light to the way Teresa lived. She has been well loved for faithfully caring for anyone in the community needing a hand. Whether it was help with grocery shopping, or an ear to listen, Teresa lived to take care of other people, never giving up on anyone or seeking recognition for herself. 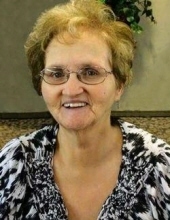 For four decades or more, she was an active member of the Tonkawa First Assembly of God Church serving as the president of the women's ministry for multiple terms as well as assisting with any other available ministry program the church offered and singing joyfully in the worship team. Survivors include her beloved daughter Amanda Rosebery and husband Donnie of Tonkawa, treasured son Daniel White of Tonkawa, cherished grandchildren: Ty Funk, Scott Funk, and Sierra Funk of Tonkawa, adored best friend Marolyn Schultz of Tonkawa, several nieces and nephews, 2 great nieces, as well as many "adopted" kids, grandkids and numerous special friends. Teresa was preceded in death by her parents and her brother Tracy Barns. Memorial contributions in Teresa's name may be made to the Tonkawa First Assembly of God Church, 206 North 2nd Street, Tonkawa, OK 74653. To send flowers or a remembrance gift to the family of Teresa L. Barns, please visit our Tribute Store. "Email Address" would like to share the life celebration of Teresa L. Barns. Click on the "link" to go to share a favorite memory or leave a condolence message for the family.